Summer 2017 marked the inaugural Ranch Crew course and, despite the course’s nascency, it felt like anything but Ranch Crew’s first rodeo (although in its future form, hopefully its actual first rodeo event will be incorporated). Ranch Crew is a two-week rangeland practicum in August held across the state of Wyoming. Divided into two primary sections, Ranch Crew begins with an intensive didactic and field curriculum in rangeland ecology and ranch management before sending crewmembers out to complete a rapid assessment on a working ranch. The 2017 crew was comprised of four Yale School of Forestry students, two University of Wyoming students and one Sheridan College student. 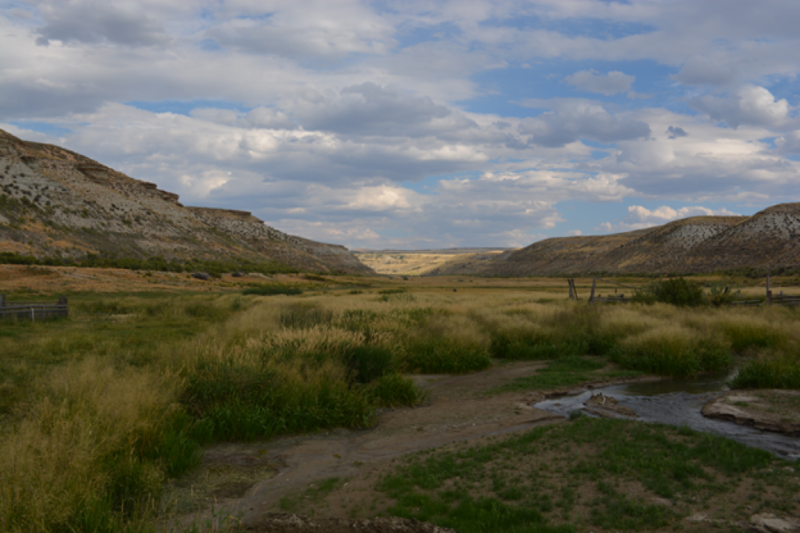 The Ranch Crew completed a rapid assessment of Currant Creek Ranch, a 2,000+ acre cattle ranch in Sweetwater County, Wyoming near the Flaming Gorge Dam. 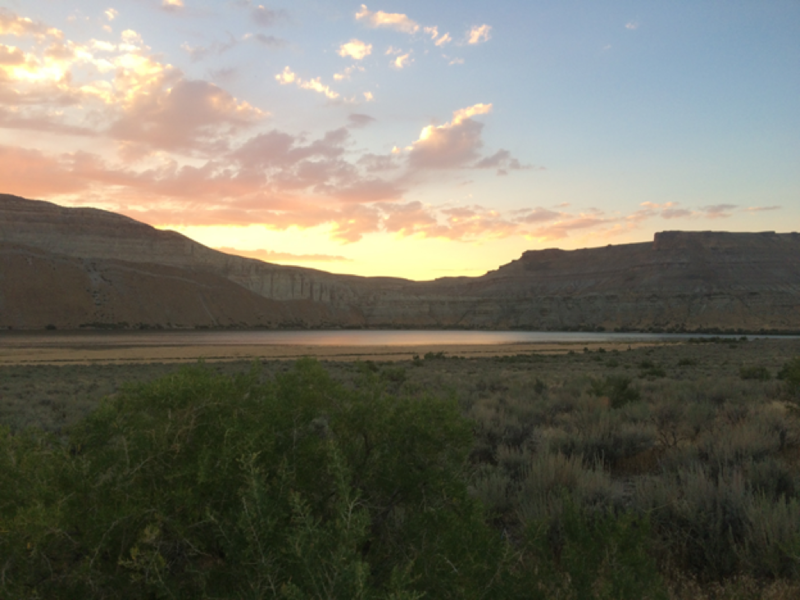 Sunset view from the crew’s field campsite along the Flaming Gorge Reservoir. 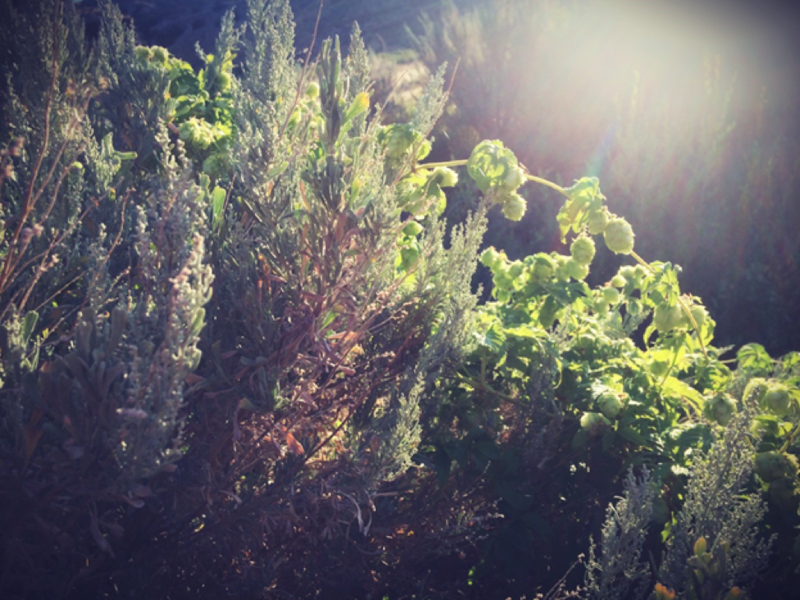 Wild hops growing over Mountain Big Sagebrush is a remnant from past land use history. Ranch Crew is an ongoing collaboration between Sheridan College, University of Wyoming, Yale School of Forestry & Environmental Studies, the Plank Stewardship Initiative, and the Ucross High Plains Stewardship Initiative. Ranch crew training began in April with weekly meetings to introduce the students to the project and the relevant topics. These meetings provided an opportunity for the students to meet the key individuals involved in the project, learn about the natural history of Wyoming, rangeland plant identification, standard sampling protocols and GIS mapping techniques. Guests lecturers from University of Wyoming, Yale School of Forestry, Trout Unlimited and other relevant subject matter experts conducted the weekly spring meetings. While the 2017 crew learned an immense amount and had an invaluable experience, we are confident that subsequent years will only improve, given the rich subject matter and the supporting staff and institutions behind the initiative. We would like to thank everyone involved for making it such a rewarding, enriching experience! The view from the Currant Creek Ranch headquarters. This entry was posted in Ranch Crew, Ranch Crew 2017 and tagged Jeremy Menkhaus. Bookmark the permalink.